Click here to jump straight to the day-by-day tale of our road trip adventure. Keep reading for a little guide to planning for your own. We landed in Iceland on April 24th, 2016, and departed May 5th. Iceland seems to be a vastly different beast from month to month – heck, even day to day (as the following will testify!). And even then, what is generally expected should certainly never be relied on. I found when researching this trip, a lot of blogs failed to mention what time of year they’d travelled – and of those that did, very few seemed to have travelled around the precise time of year that we did. And so this is my caveat: this is a tale of adventure through Iceland at a very specific time of year. This should be highly relevant to expectations on a) weather and b) the kind of pros and cons you can expect as a traveller visiting outside of peak tourist season. As far as tourism goes, it was extremely quiet. Our first two proper days travelling from Keflavík to Höfn were really the only days we saw a build-up of people at attractions, but even then it was minimal. We certainly never felt like we were jostling to see anything or take beautiful pictures. After leaving the South, honestly, we barely saw any other tourists. It was a tourist ghost town. It was really quite incredible. It’s the most peaceful place I’ve ever been. 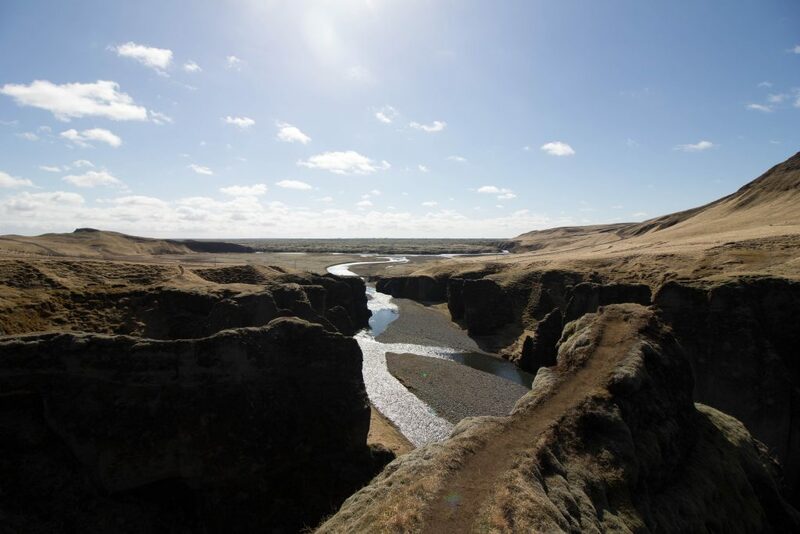 The official camping season in Iceland runs from mid-May to mid-August, and as such most campsite facilities are completely closed outside of this period. There are a few campsites that open year-round to varying degrees of facility, and we largely based our itinerary on these (to varying degrees of success!) with the help of tjalda.is. I’ve detailed below our sleeping solutions for each night. The weather is unpredictable. I think this is pretty common year-round, but we weren’t expecting to run into crazy snowstorms in the North-East like we did. My biggest tip: use road.is (up-to-date information on the conditions of roads due to weather) and vedur.is (weather information – including aurora forecasts if you happen to be travelling at the right time of year) religiously. 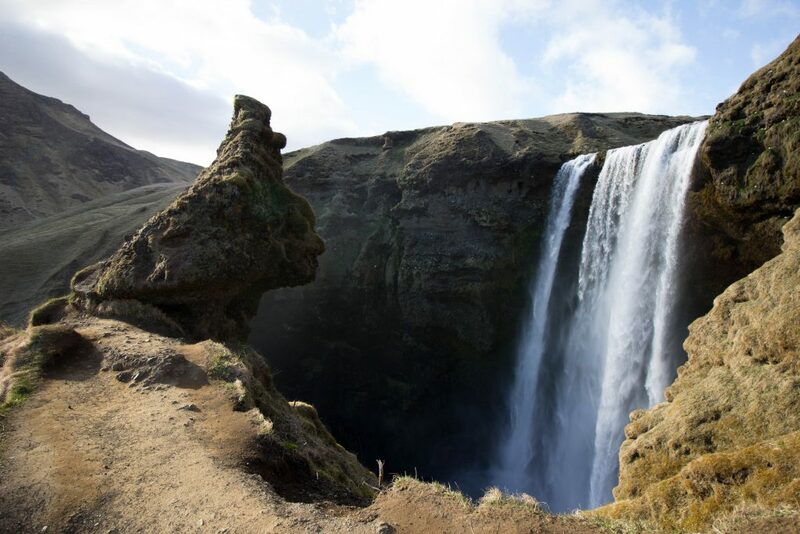 Because of Iceland’s excellent Route 1, or ‘Ring Road’ – a road that loops around most of the country – and the concept of being able to travel at our own pace (rather than racing to meet accommodation check-ins), we chose to explore Iceland for the first time in a camper van. After much research we settled with a Happy 1 from Happy Campers. We really liked the layout of this van, it included unlimited kilometres, and all the reviews we read were great. Service-wise, I cannot fault Happy Campers. The guys who helped us on our way, and welcomed us back bleary-eyed to Keflavík nine days later were awesome. 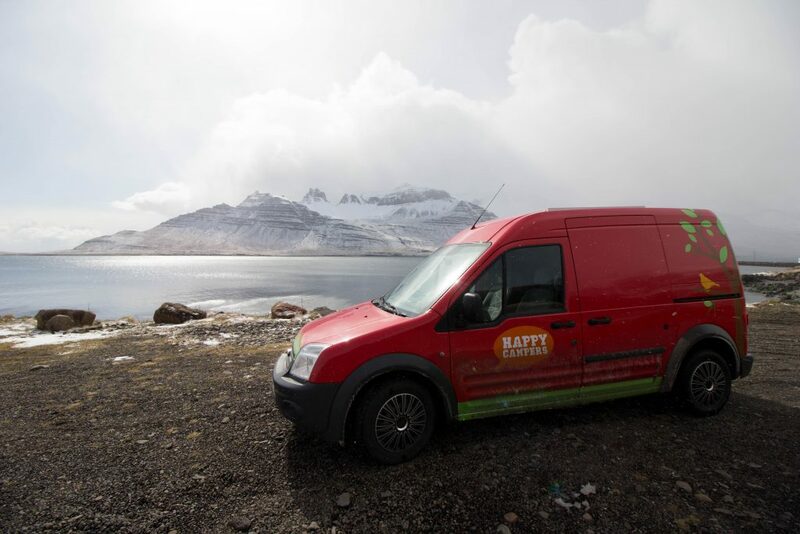 We absolutely adored our Icelandic camper van experience, and we wouldn’t trade it for the world – but we won’t be doing the same thing next trip and I certainly wouldn’t recommend it to anyone travelling outside of peak season if you’re planning to head north. We ended up doing a lot of driving through snow in our little 2WD camper van, and it was a pretty stressful experience despite the fact that Mat is a really excellent driver. These things just aren’t built for that kind of driving. We had to be rescued by police when bogged in snow, towed out by a local after getting snowed in at our campsite overnight, and pushed out by a throng of chilly drivers who were luckily on hand after just digging out a similarly bogged motorhome. A 4×4 vehicle would have made our lives much, much easier. A 4×4 would have also given us a lot more freedom to take the road less travelled. 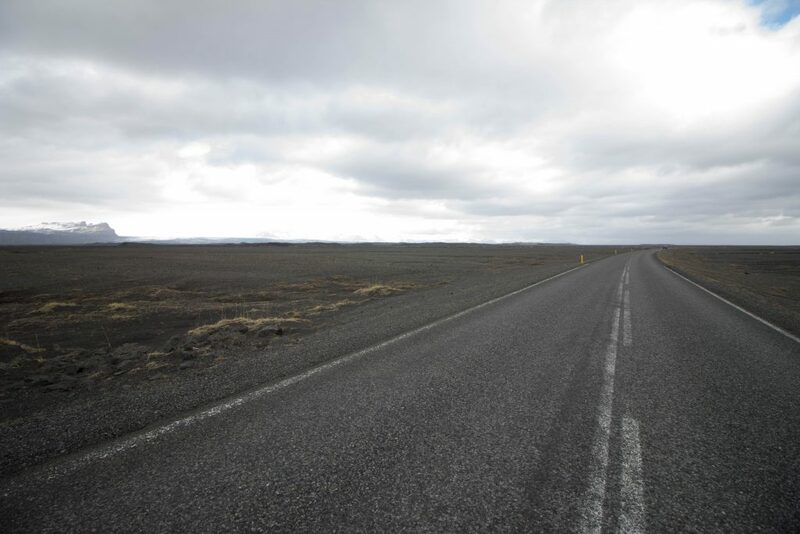 Some of Iceland’s roads – mostly leading into the highlands – are marked as ‘F Roads’, and can only be traversed in a 4×4. Whilst these roads are also generally closed outside of the peak summer period, we did encounter a few situations in which particular attractions were out of reach because of our vehicle choice. Luckily, Hannah and Taylor (my sister and her friend, who we travelled with for the first 2 days) had been upgraded to a 4×4 so we got to jump in their car to detour to a couple of cool little side adventures. There are also just a lot of unpaved roads in Iceland, and it can be exceptionally tough-going driving in the best of weather conditions. If you’re determined to do Iceland by camper van, don’t let me discourage you. It was a really amazing experience and it allowed us such freedom in choosing where we wanted to stay each night and discover the country in a natural, exploratory way. Small trips, and particularly trips taken in peak season are not likely to run into the kind of troubles we did. 4x4s don’t come cheap (in a holiday that is inevitably already probably very expensive). But if you have the means, I urge you to go by 4×4. 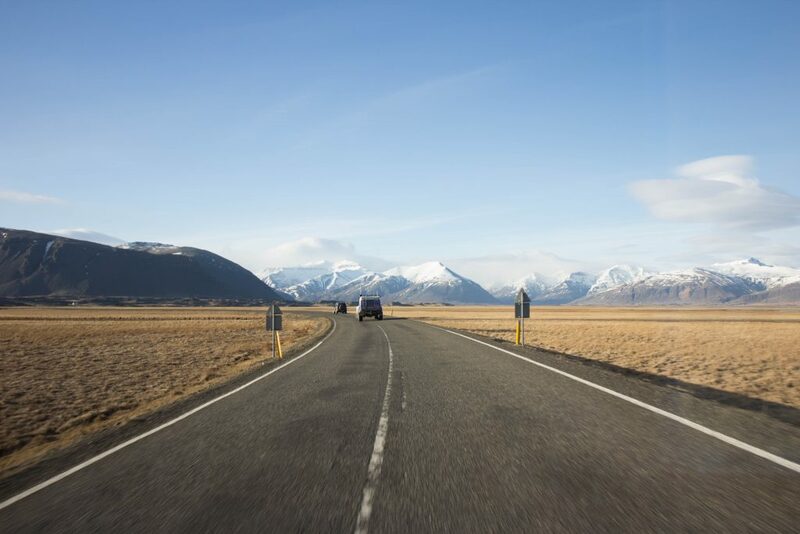 That offers another sort of freedom – you can go more places, and it’s just generally more equipped to deal with Iceland’s often rugged and ferocious landscape. Heck, there are even some 4×4 camper vans you can hire if you truly want the best of both worlds (but: expensive!). 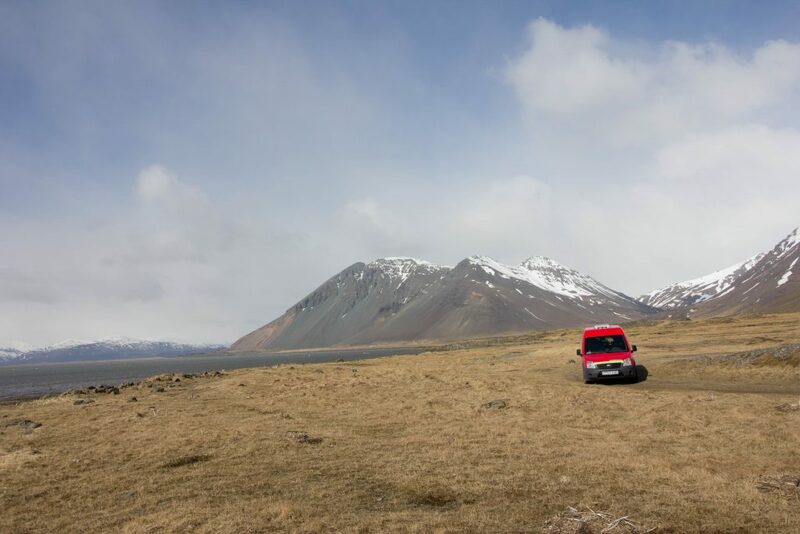 Now that we’ve travelled Iceland once, we feel confident with the kinds of places we’ll want to stay in next time, and experienced enough that we simply never want to suffer the shortcomings of a 2WD in Iceland again. Also, one last tip: hiring sleeping bags was an optional extra, and I can’t imagine how we could have possibly slept without them. We slept in full layers of clothing, a sleeping bag, and then the small amount of bedding provided by Happy Campers, as well as heating up the van for 30 minutes (sometimes longer) as Happy Campers advised. And we often still woke up freezing. I think this option should come with a strong recommendation from Happy Campers at this time of year. 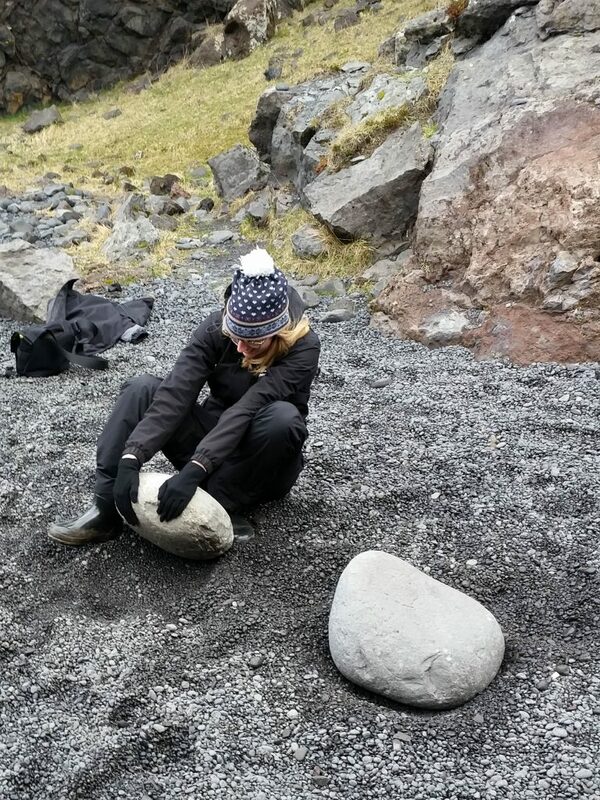 The best decision we made in packing for Iceland was our footwear. We ummed and ahhed a lot in trying to decide what footwear to buy for this trip, and quite by accident a fellow at Aussie Disposals offhandedly mentioned a waterproof boot on sale – Bogs. Bogs are basically neoprene-lined gumboots that can withstand temperatures down to -40 degrees Celcius. We were slightly sceptical at first, because they seemed kind of ugly, but they feel amazing to wear. And you know, they don’t actually look too bad! 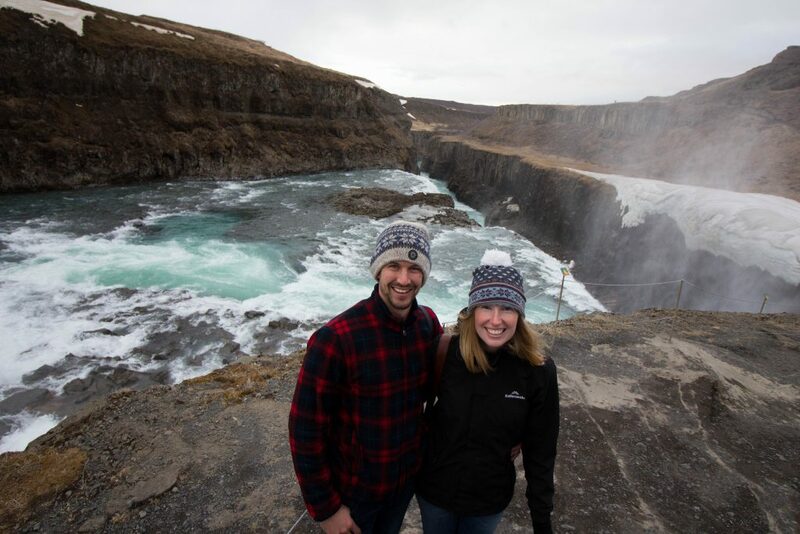 In Iceland they were an absolute dream a) because they kept our feet so toasty warm and b) they were great in the snow, around waterfalls, beaches, lagoons – you name it, the Bogs could take it on. Honestly, they were the best. These are the ones I bought. Make sure you have thermals – we wore Uniqlo heat-tech, but some more heavy duty stuff could have come in really handy up north. We just piled on layer upon layer and mostly got by fine. We wore Kathmandu weatherproof jackets, but next time I think I’d also like something with some down insulation as I really feel the cold. Beanies are a must! I would also highly recommend taking a guidebook like Lonely Planet. I was gifted a copy by Mat’s mum for my birthday, and god I’m glad we had it. Guidebooks tend to get a bad rep these days, but honestly – this was our bible. We used the maps for each region extensively. 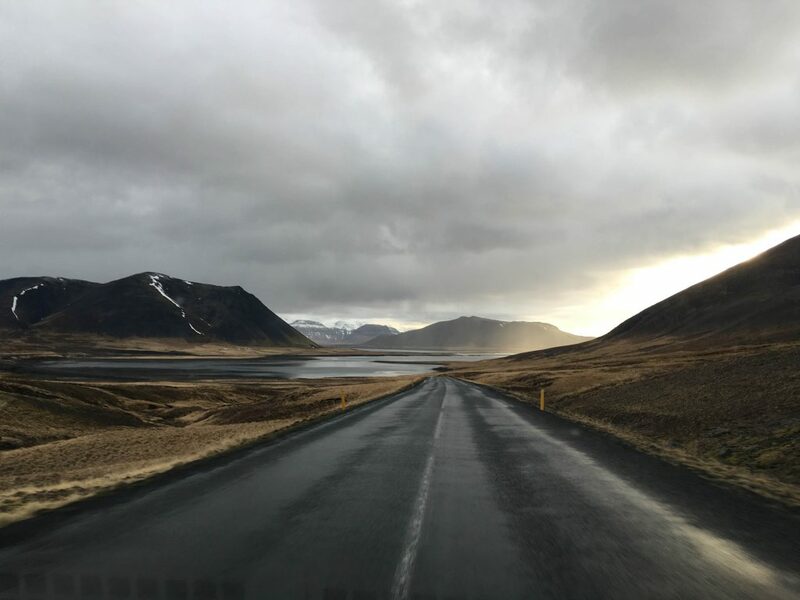 Sure, our GPS told us how to get from A to B – but in a country like Iceland, having that Lonely Planet at hand to keep track of all the little detours and attractions along the way was invaluable. Natural wonders don’t go out of date! We also found some amazing little stop-offs because of our guidebook, like Kaffihús Bakkabræðra (see Day 7). This is the story of our Iceland trip. I’ve bolded and underlined anything that we especially loved. And if you have any questions, please reach out in the comments. Happy to help! 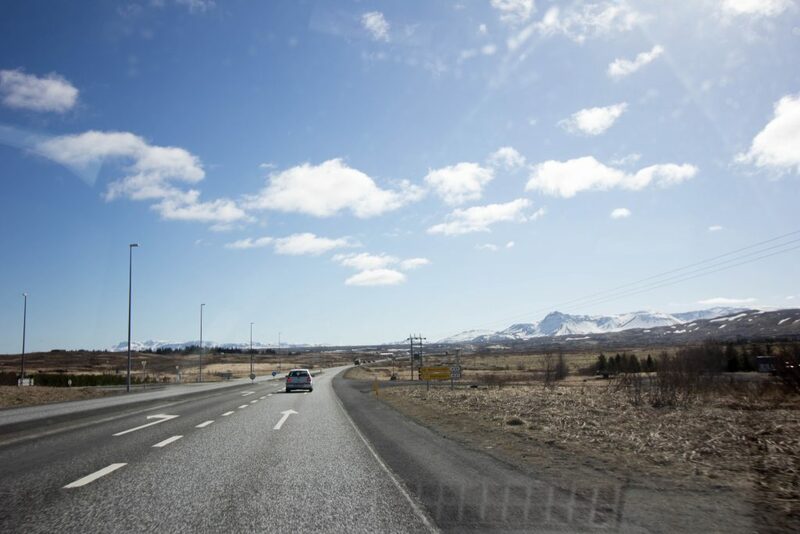 Keflavík, about a 40-minute drive from Reykjavík, certainly isn’t the most happening of towns – but we’d been in transit for 34 long hours and thought it best to get a good night’s sleep before picking up our camper van (the Happy Campers depot is in Keflavík). We chose Start Hostel and it was really great for a short, close-to-the-airport stay. They provided advance directions by car and public bus, but again – 34 long hours in transit meant that we wanted the easiest option: taxi. It was a short, expensive trip at $3000ISK (approx. $35AUD). The hostel was exceptionally clean, and had the most amazing, comfortable down doonas. A nice breakfast was provided in the morning too. As far as other food options go, the area is a bit of a ghost town. We got a quick dinner at a pizza place a bit of a walk away. We picked up our Happy Campers van, then made a beeline for a Bónus nearby to stock up on groceries for the trip. Bónus is one of Iceland’s big budget supermarkets (kind of like Aldi), but has pretty limited opening hours – this one not opening until 11am on a Monday, as we would discover. Luckily Iceland’s other big budget supermarket, Krónan, was open. There’s something thrilling about a supermarket shop in a foreign country – even (or perhaps more so?) if you’re doing a simple run for a road trip. 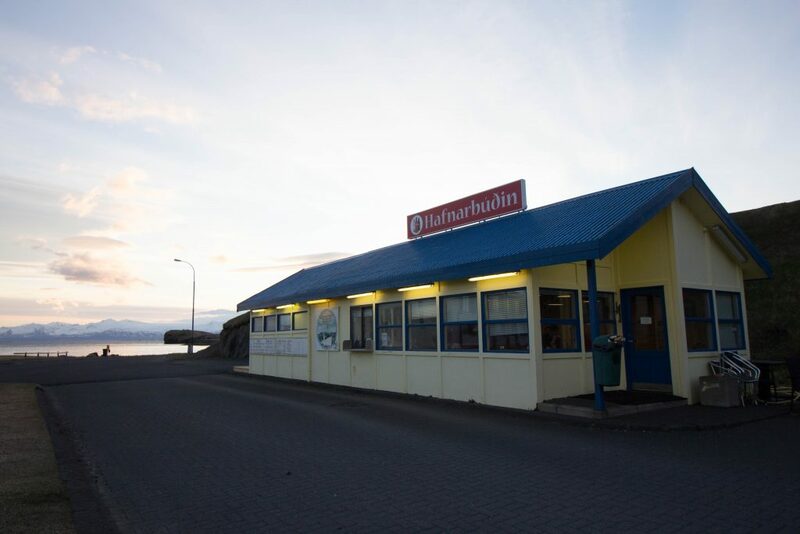 These shops became sandwiches by waterfalls, Weetabix in service station car parks, and lots and lots of Iceland’s Nói Síríus chocolate. And so we set out through the undulating, completely otherworldly lava fields covered in delicate green moss, led happily by the GPS we hired from Happy Campers (which I wholeheartedly recommend). 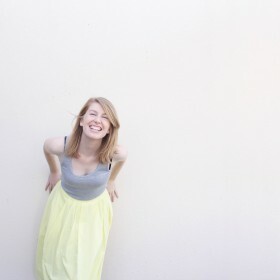 My sister Hannah, at the time a temporary Londoner, had arrived in Iceland the day before and joined forces with her Canadian friend, Taylor. We met them at the town of Selfoss (an emotional reunion in a Krónan carpark) to begin exploring the southern part of Iceland together. It was also here in Selfoss that we first realised the authors of the Iceland Lonely Planet guide could be quite ruthless indeed. 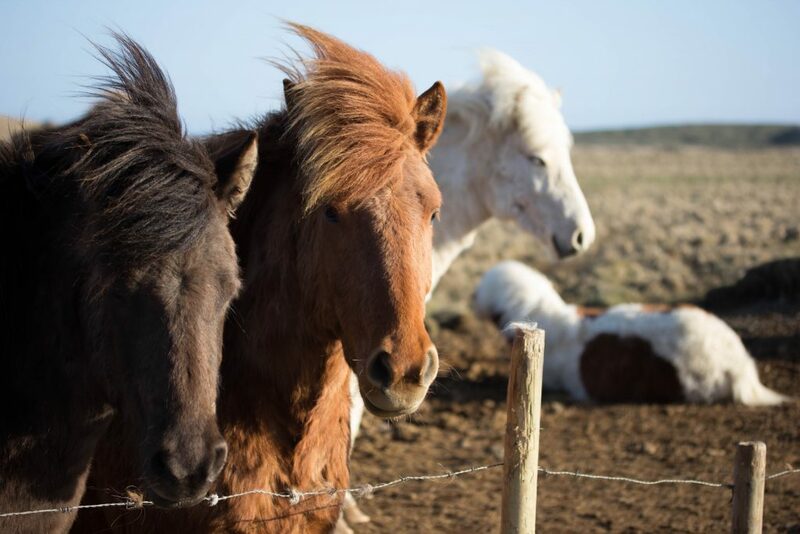 To quote: “Selfoss is the largest town in Southern Iceland, an important trade centre, and witlessly ugly.” On the contrary, whilst we stopped for perhaps only an hour, it left a lovely impression on us. This was largely in thanks to the cosy little Kaffi Krús café, where we got a joyful crash course on Icelandic from the owner to go with our morning tea. 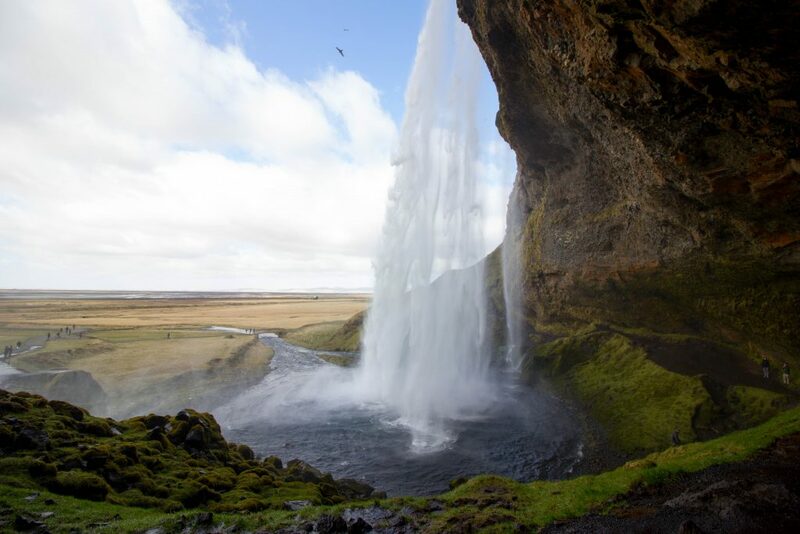 Our first, heart-bursting experience of Iceland’s natural beauty was Seljalandsfoss. 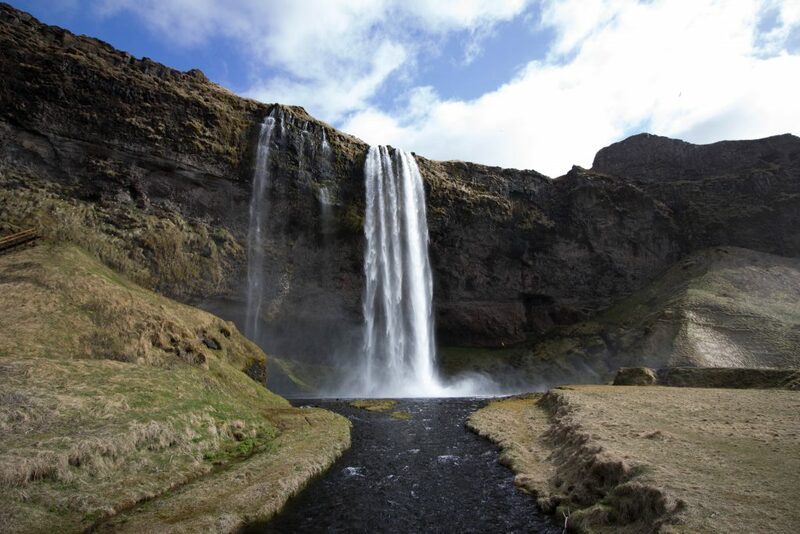 Seljalandsfoss is a gorgeous waterfall that you can climb up behind (except in Winter, when it becomes too dangerous). It is loud and cold and wet and absolutely exhilarating. We found ourselves in hysterical laughter at how insanely magnificent, and how utterly Icelandic it was. A little ways along a track from Seljalandsfoss we stumbled upon another waterfall (which I later discovered is Gljúfrabúi). Don’t skip out on this one. To see it proper, you need to walk through a crack in the rocks where the river flows out. 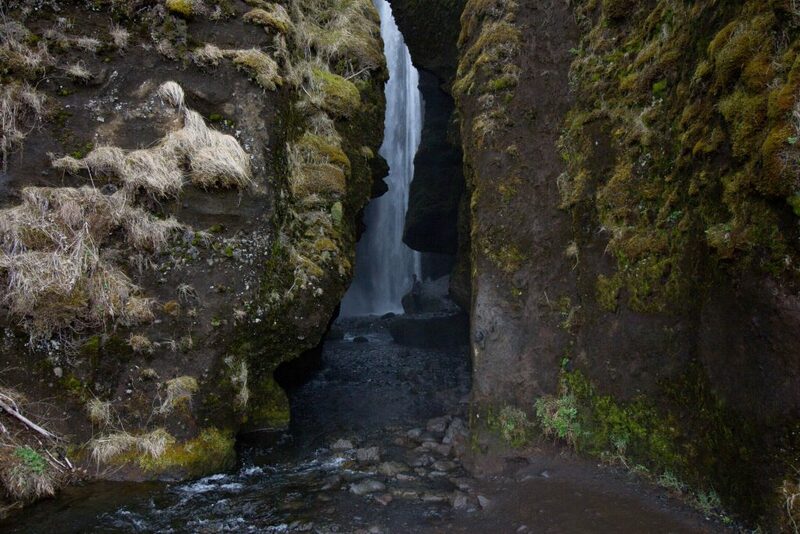 Walk in a ways and the crack opens out into the mystical Gljúfrabúi waterfall cavern. Again, expect to get very wet. It’s dark and mossy, but shafts of light pierce through from above and there’s mist spray pummelling you and it’s all very magical. Seljavallalaug was our next stop, and our first Icelandic hot spring. 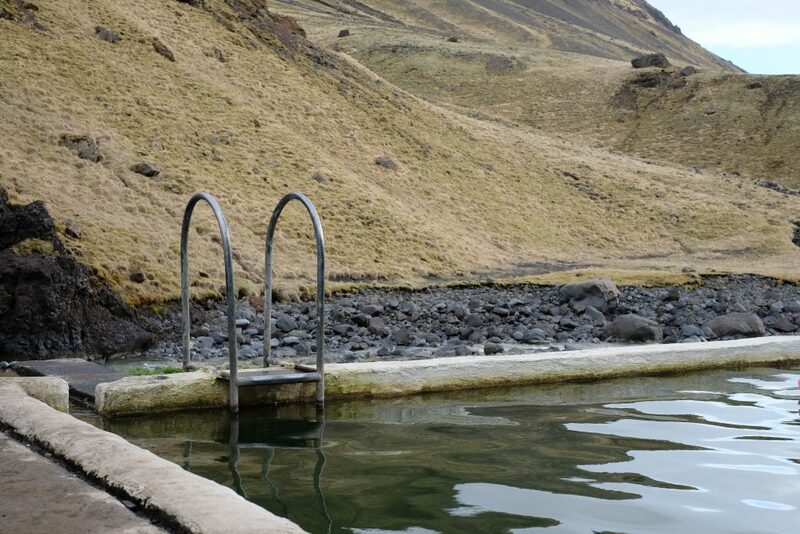 It’s one of Iceland’s oldest man-made swimming pools (it took a bit for us Aussies to get used to, but ‘swimming pool’ refers to a geothermally heated pool in Iceland), with water piped in from a natural hot spring nearby. You’ll need to trek for maybe 15-20 minutes from the carpark to get there, and it’s best to hop into your swimmers in your vehicle (and pop some warm clothes over top!). 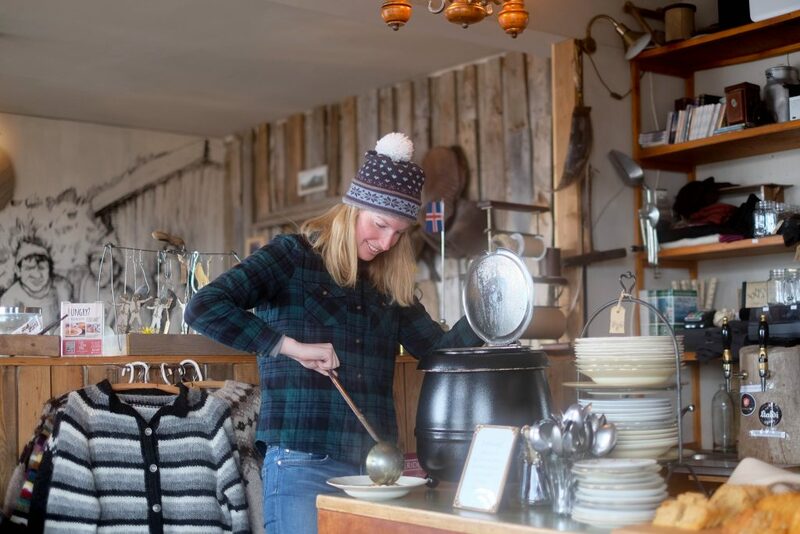 Selvajallalaug is free for entry, and visitors are tasked with treating the place with care – but we found the changing rooms weren’t the most inviting places to spend a great deal of time. The pool itself is a beautiful, calming experience.The temperature of the water is quite mild, though very lovely and hot in one corner where the water is piped in. 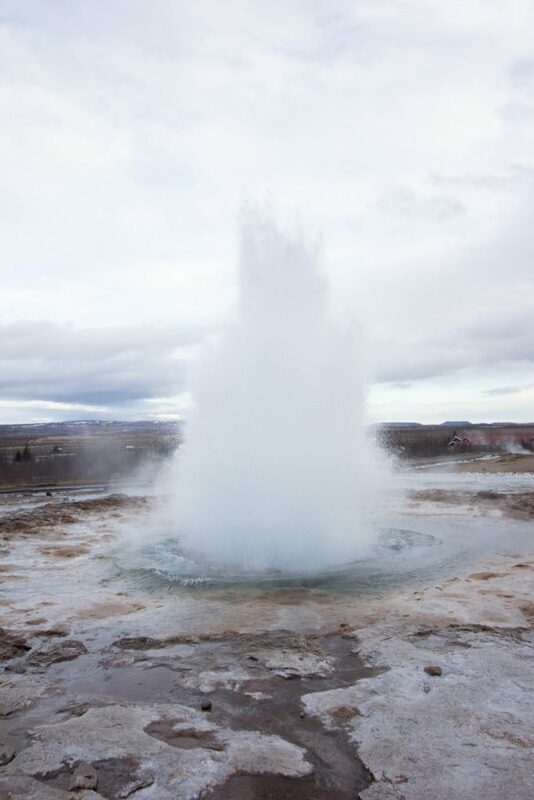 With only perhaps 20 other people visiting, it was so peaceful – the mountains loom up on three sides and again, it was a very Icelandic moment. 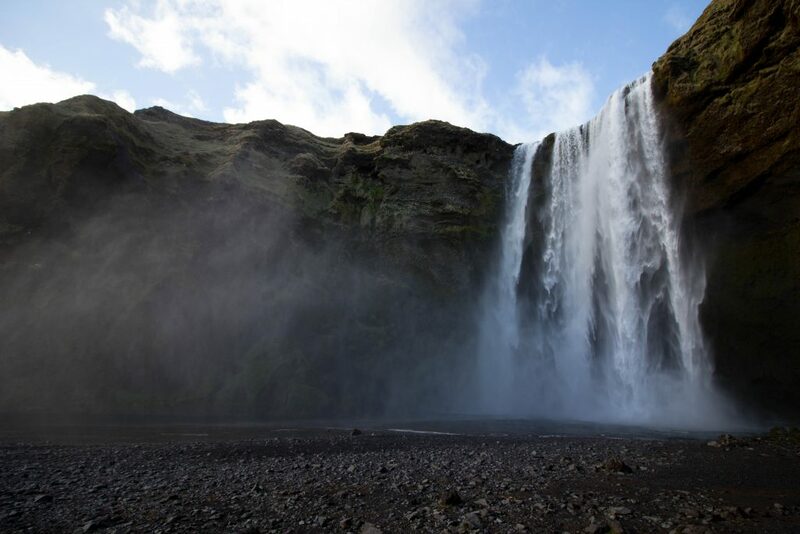 A short trip further along Route 1 is Skógafoss, another of Iceland’s famous waterfalls. It’s stunning, and we caught some beautiful rainbows through the waterfall mists. There’s a hike up to the top where you can get some really great photos, especially if the sun is dipping like it was for us. It’s at this point where one might try to visit the famed US Navy plane wreckage between Skógar and Vík, but the road to that attraction was closed shortly before we visited – entirely due to tourists driving off-road across private property and destroying much of the delicate land. It’s still possible to pull over and hike out to the wreckage, but honestly – we were happy to leave this poor place be. We did catch a far-off glimpse from the road though, which in itself was quite cool. 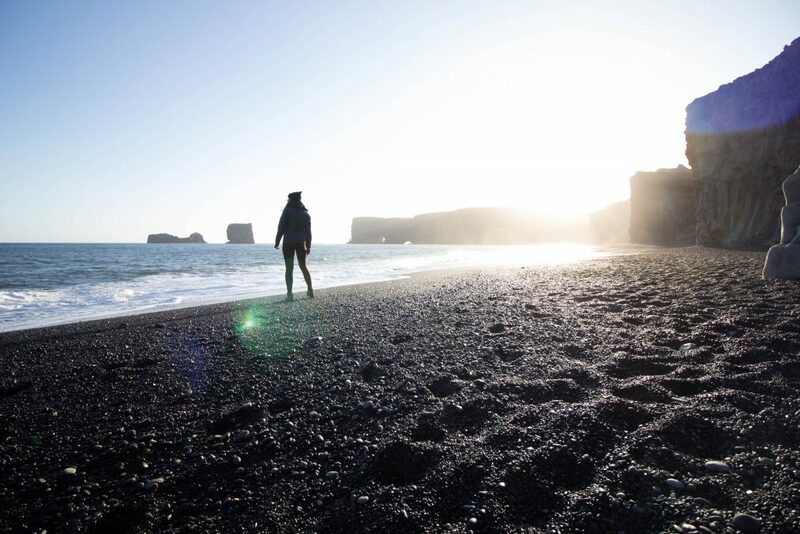 For our last stop we visited Dyrhólaey, one of Iceland’s more famous black beaches. By the time we’d crept out to the end of Route 218, the sun was falling into its long, slow sink toward the horizon. It was crispy cold, and the light was so beautifully golden. 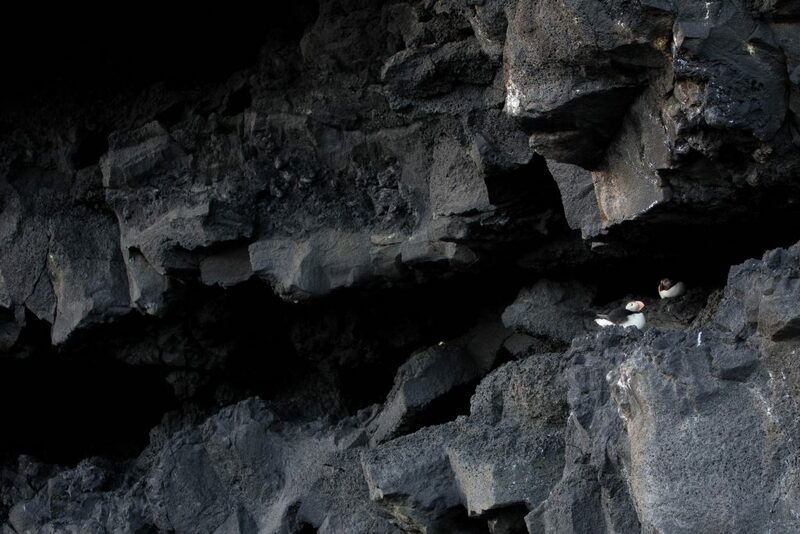 We took our time walking down along the beach, and were thrilled to find that puffin season had just begun; we spotted many puffins nesting up in the cliffs. We drove up to the lookout, which is is a very, very precarious one in a 2WD – but the view was incredible and we saw the most marvellous show of gulls and puffins playing in the air currents. Sandwiches in the back of the camper van wrapped up a pretty bloody marvellous day. While Hannah and Taylor stayed at a guesthouse in Vík, Mat and I spent our first night in the camper at the town campground. Unfortunately the facilities weren’t open at this time of year. 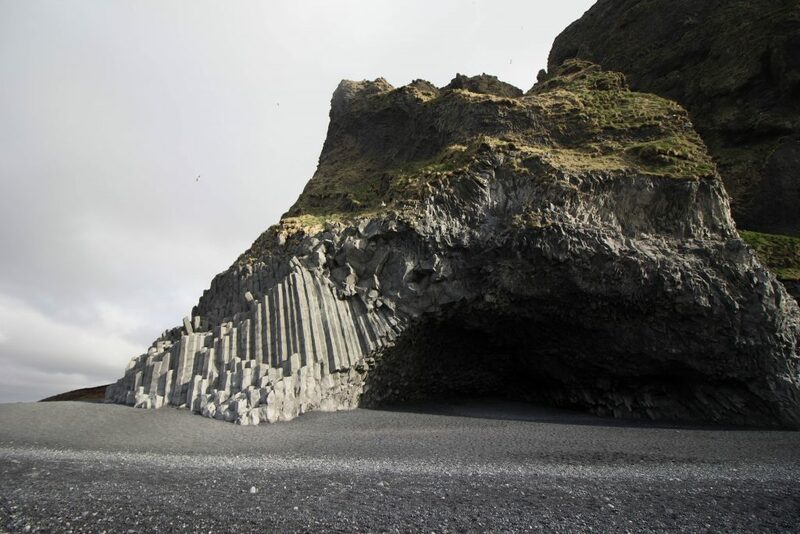 Before continuing East, we looped back to explore Reynisfjara – a continuation of the black-sand beach which sports some amazing basalt column formations. Back on Route 1, we stopped at Kirkjugólf (or the Church Floor). This is another cool basalt rock formation that’s smoothed right down to what Icelanders once mistook for a tiled church floor. A nearby sign claims that just one of the basalt ’tiles’ has ten sides, and we spent a lot of time here trying to find it to no avail. We got the feeling that the elves might have been playing a trick on us here. 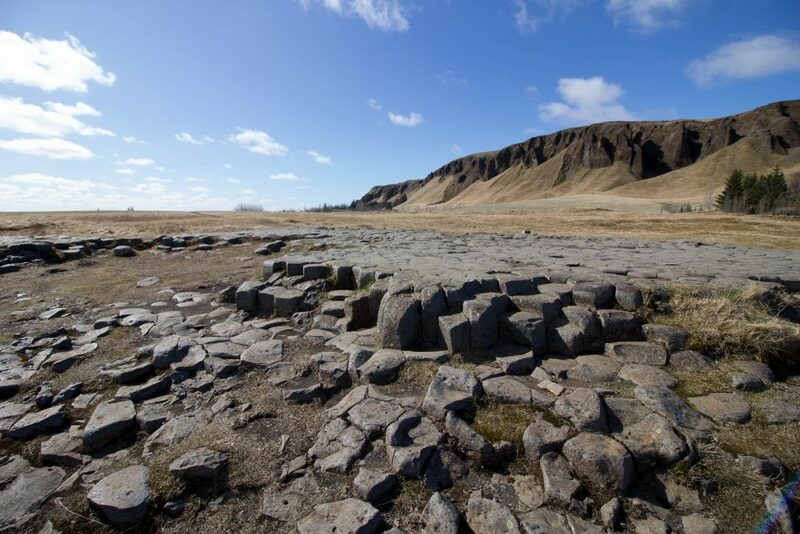 Next up was one of the best finds of the trip – Fjaðrárgljúfur. This is an absolutely spectacular canyon, and what made it even more bonkers was the fact that we were the only ones there. We jumped in Hannah and Taylor’s 4×4 to get there, though the canyon trail does branch off before the road becomes an F-Road. This place is is a dream. We had beautiful weather too – the sun beat down on the golden grass and piercing blue water and it was just extraordinary. Mat and Taylor even risked a jump in the glacial river, though sprung out very fast indeed! We stopped for more sandwiches beneath Foss á Síðu, a slender waterfall slicing down the rocks nearby Fjaðrárgljúfur. Apparently during strong winds this waterfall can look as though it’s flowing upwards. Back on the road, we were quickly acquainted with The Sandar. Another charming introduction from Lonely Planet: “The sandar are soul-destroyingly flat and empty regions sprawling along Iceland’s southeastern coast… The sandar here are so impressively huge and awful that the Icelandic word is used internationally to describe the topographic phenomenon of a glacial outwash plain.” Vast and empty indeed, but it was hard not to find it simply breathtaking that the Icelandic landscape can change so quickly, and from one completely fantastical vista into another. We jumped in Hannah and Taylor’s 4×4 to drive up a dirt road to Svínafellsjökull, an outlet glacier of the larger Vatnajökull. This was a really cool chance for us to get up close to a glacier. 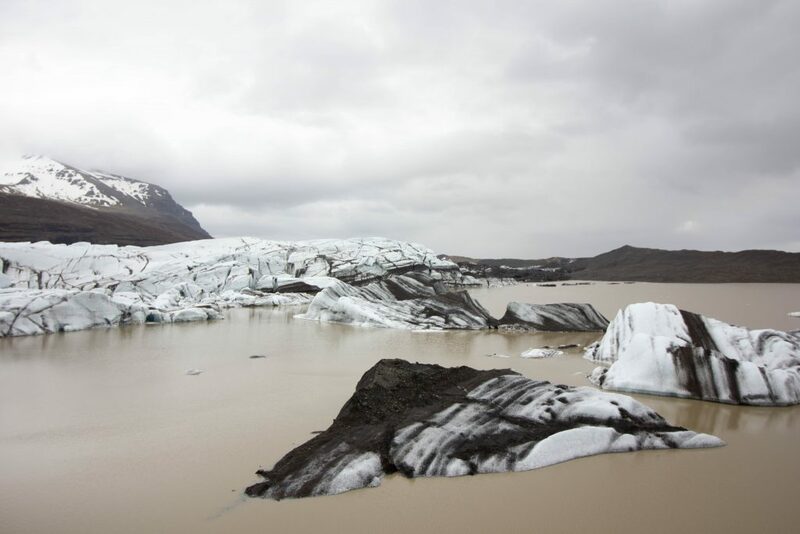 Svínafellsjökull is slashed in black streaks of volcanic ash, adding quite the otherworldly factor. So otherworldly, in fact, it even appeared as a far-off planet in the movie Interstellar. Up next was Jökulsárlón, the famous glacier lagoon. 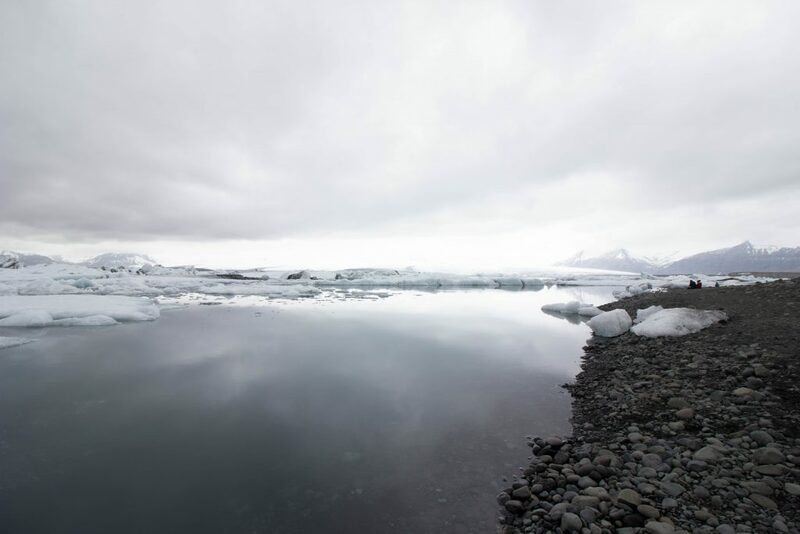 Aside from being a stunning feat of nature, Jökulsárlón was profoundly quiet and peaceful. 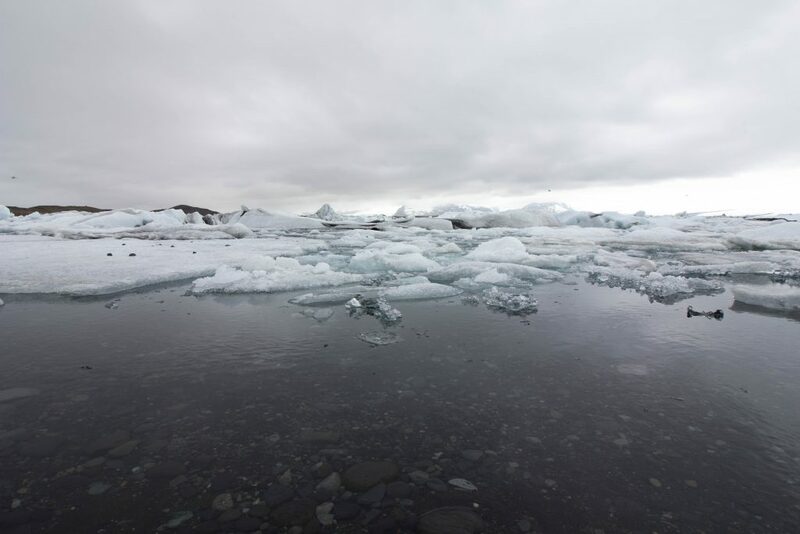 You can actually hear the icebergs crackling as they make their slow pilgrimage out to sea. Our Southern Iceland adventure would end in the fishing town of Höfn. We arrived just in time for a quick, delicious dinner at Hafnarbuðin – a charming seaside shack serving up langoustine (scampi) baguettes. It’s the no-frills, all-heart kind of place you’d expect Anthony Bourdain to fall in love with. Mat and I were thrilled to find Höfn Camping and Cottages (on the main road into town) had been opened ahead of camping season due to tourist demand; apparently the service station across the road had grown impatient with campers setting up shop there instead. This was a wonderful little campground with shower and cooking facilities, as well as a cosy little indoor area. We were hugely grateful for it! Whilst Hannah and Taylor had to turn back to Reykjavík, Mat and I pressed on up the East coast, and our first taste of fjord life. 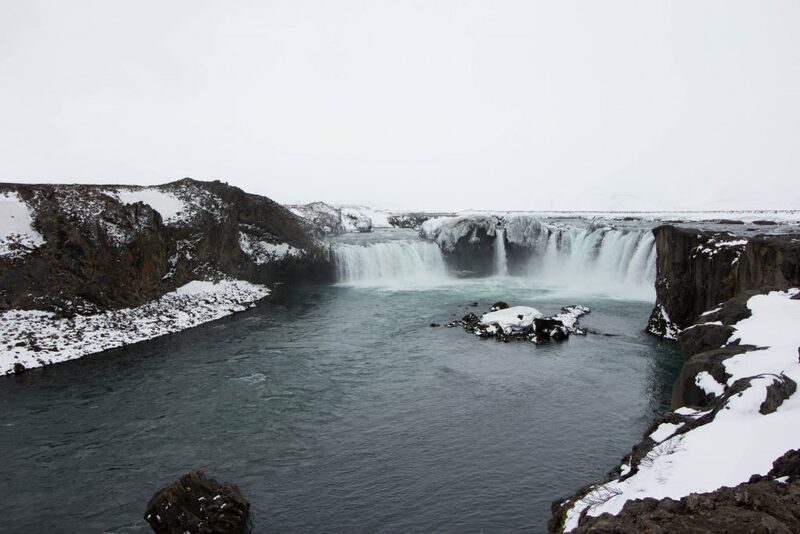 We experienced Iceland snow falling for the first time, and were giddy with delight. 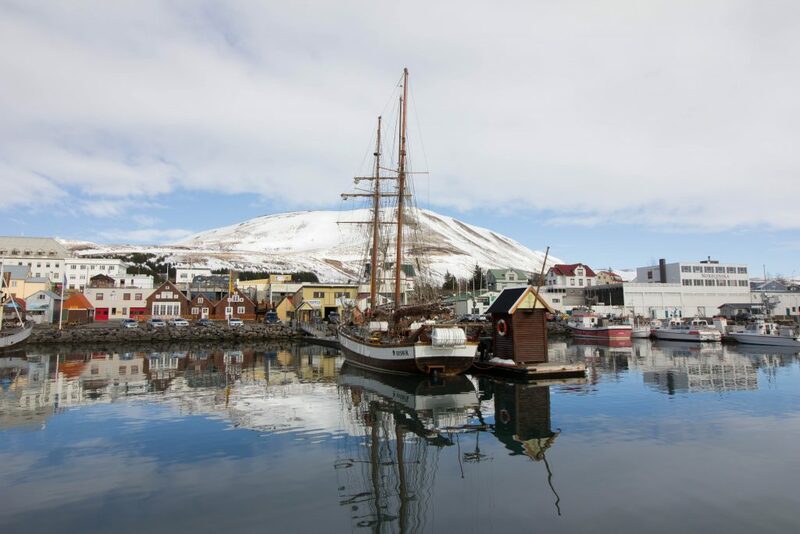 By the time we’d reached Egilsstaðir (Lonely Planet: “However much you strain to discover some underlying charm, Egilsstaðir isn’t a ravishing beauty.”) we’d decided not to trip out to Seyðisfjörður as planned – but we’d read up on Borgarfjörður Eystri and didn’t want to miss it. 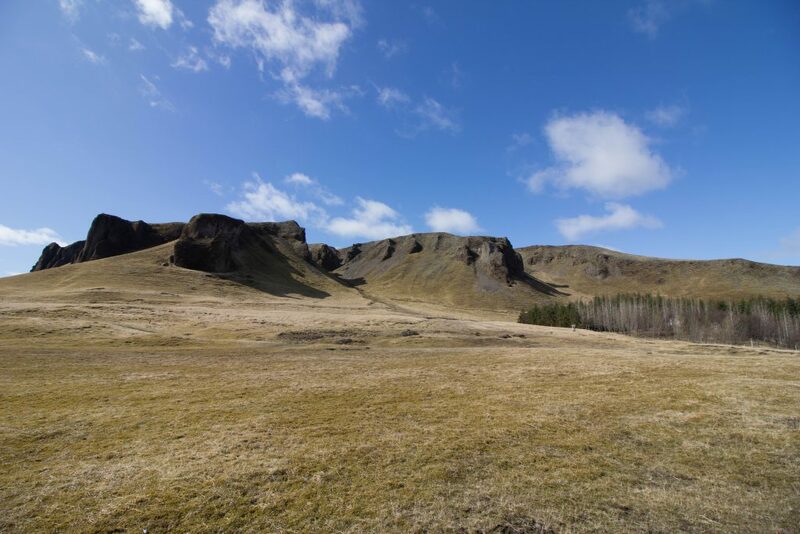 The plan was to drive up for the afternoon, stay for dinner and be back to spend the night at the Egilsstaðir campground (another campground with full facilities open ahead of camping season – hurrah!). 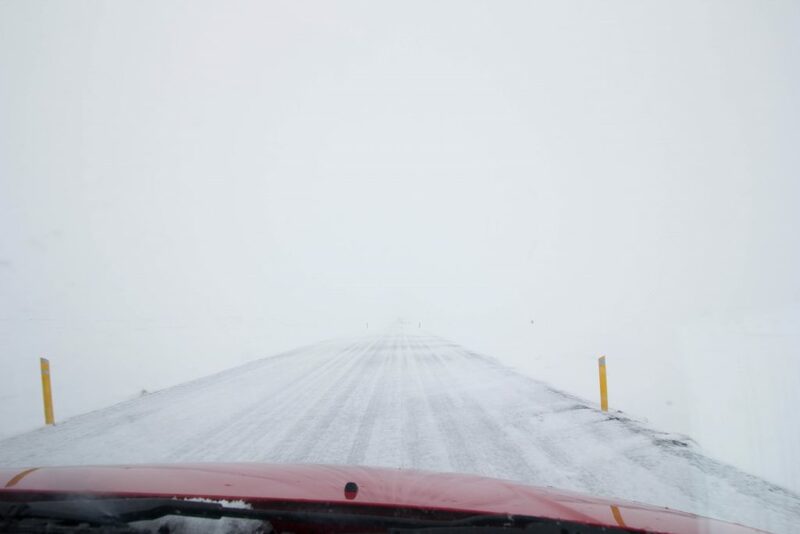 As we made the drive up Route 94, however, we learned the hard way how brutal Iceland’s weather can turn. And fast. 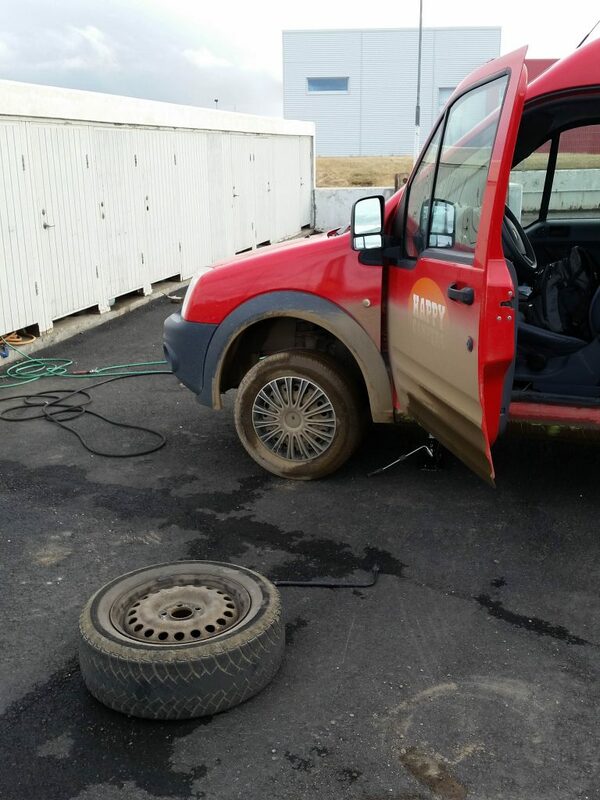 Long story short, we had to be rescued by the Icelandic police. A few Icelanders passing by, including the head of the local rescue committee (who very unfortunately, due to the inclement weather, was late for a flight so couldn’t stop to help) did their best to assist, but ultimately it was the Icelandic authorities we eventually had to call (thank the elves we had a functioning travel SIM card) who arrived to save the day. A lovely man in a balaclava extracted the van with almost terrifying speed, and they drove us back down the mountain before quickly dashing off to another rescue. It was a bloody scary experience, and one I certainly don’t recommend. But it does make for one heck of a story. A note: for any other travellers intrigued to visit the vending machine hut on Route 94 that’s mentioned in the Lonely Planet guide – it was was nailed shut when we drove by. On Day 5 of our Iceland trip, we woke to the realisation that we’d been totally snowed in overnight. Obvious tip: if it’s snowing, and you’re driving a 2WD, perhaps just park in the asphalted carpark rather than a secluded corner of the grassy campgrounds. Luckily, Icelanders are probably the best people on earth, and a local driving by came and towed us out. 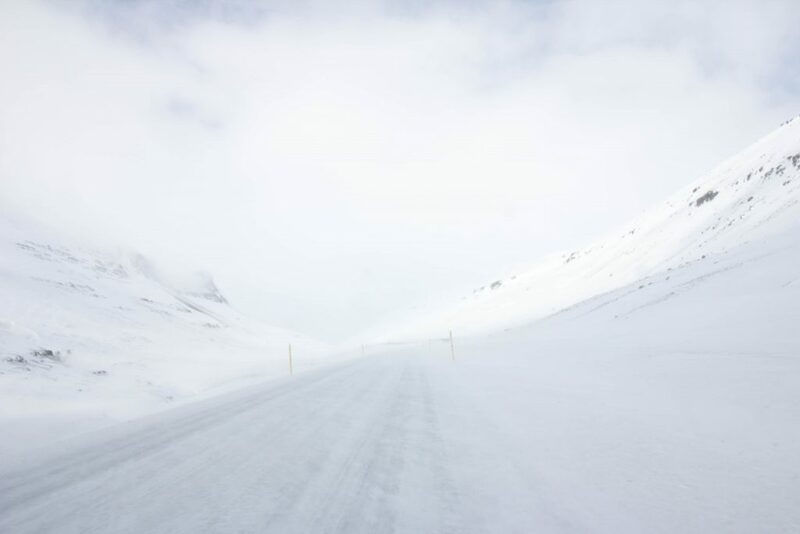 We also woke up to the news that the roads north of Egilsstaðir were closed due to the weather, including even Route 1 on which we’d planned to continue to Akureyri. We hung about in the campsite’s cosy reception sponging wifi and hot chocolate until the staff gave us the all-clear (thanks to road.is, our new best friend) and we pressed on. The thing about the roads opening, however, is that they can just as easily be closed again. And if you’ve already begun the trek from Point A to Point B? Well, that’s where we once again found ourselves. 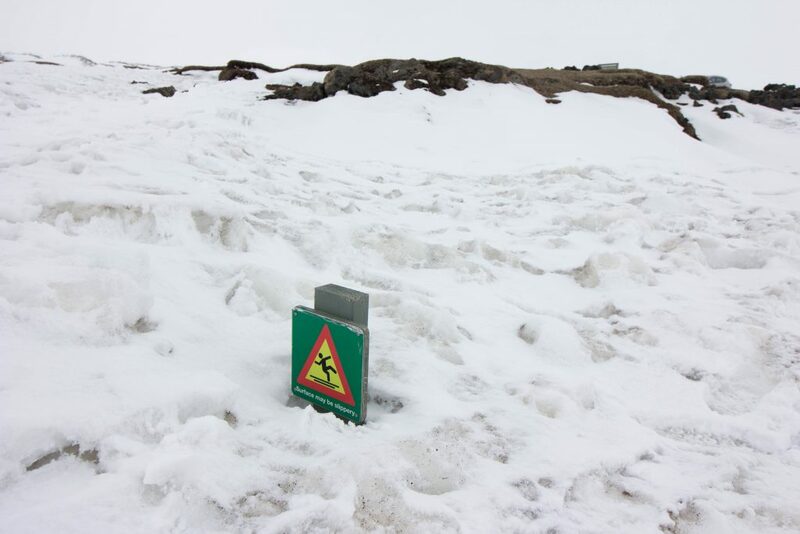 It was another gut-churning journey through Icelandic snowstorms. As least this time we weren’t entirely on our own – we were in a small procession of vehicles timidly making our way through the no-man’s land of suddenly ‘impassable’ roads. Everything came to an abrupt halt when a motorhome became bogged in the middle of the road, forcing all vehicles to stop and empty out to push it free. Mat did most (all) of the work on the little Happy Camper’s behalf. Of course, we got bogged in the same spot when the procession followed through, but we had a tired and ready team on hand to push us out in no time. Hot tip we learned: take your footwell mats and wedge them in front of your tires for an easy escape! The weather sadly made the famous Dettifoss impossible, and we also bypassed the idea of Mývatn Nature Baths in the middle of a snowstorm. Goðafoss was our saving grace. It had finally stopped snowing, and the majestic waterfall beckoned gently from the roadside. After gruelling hours driving in the snow, it was exactly the pitstop we needed. The landscape was white and black and blue, and utterly beautiful. We pulled into Akureyri, relieved that the day’s driving was over. City Campsite in town was closed, but eventually – though our GPS was not much help at all – we found Hamrar Campsite, and we were so glad we did. 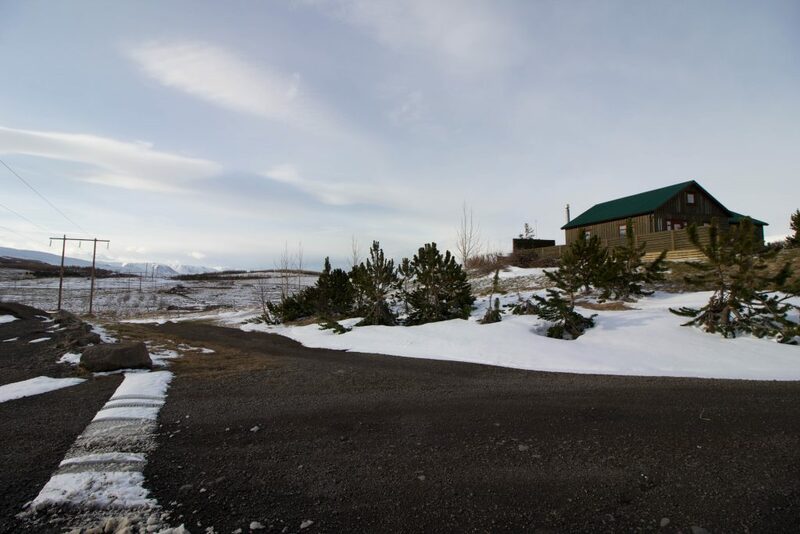 Hamrar is situated just on the outskirts of Akureyri, though we felt like we were a million miles from anything. There’s a gorgeous old wooden lodge with showers and a great kitchen, plus an attic available with mattresses if you need to crash indoors for the night. Despite sharing the previous two campgrounds with several other travellers, we shared Hamrar with only one other traveller this first night, then had it all to ourselves the next. 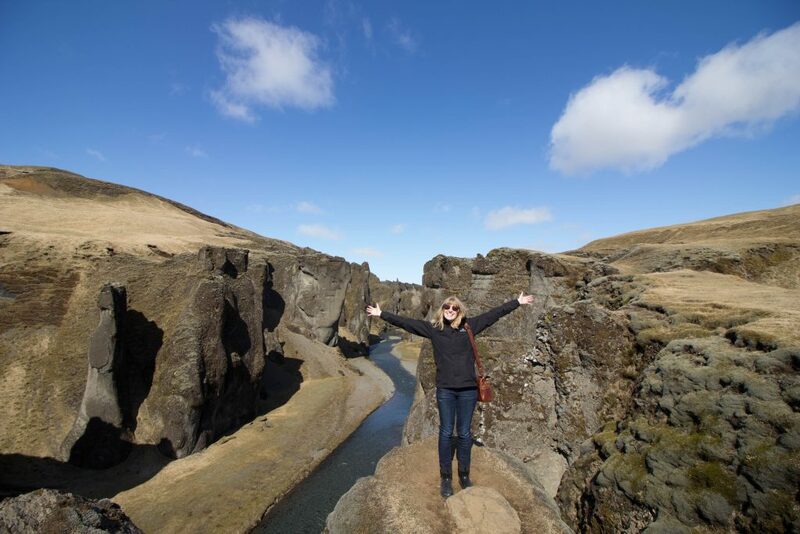 How happy we were to find one of Iceland’s best-kept secrets. 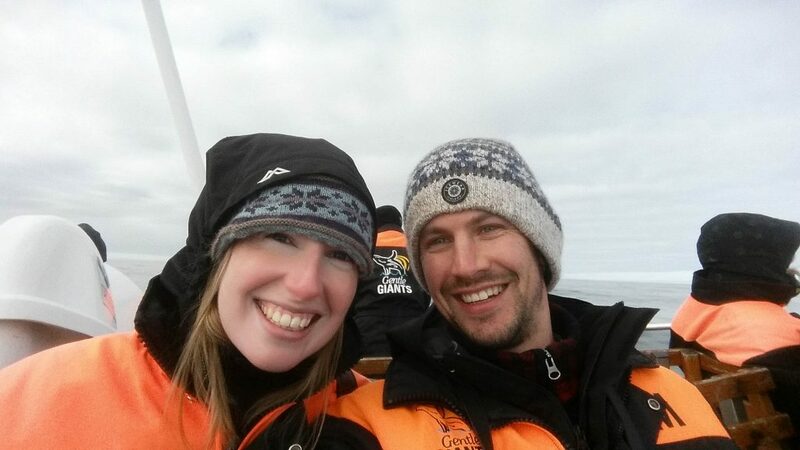 Though we were a touch early in the season, we took a chance and drove to Húsavík with one thing in mind: whales. Húsavík is the whale capital of Iceland, and during peak summer season you’re essentially guaranteed a whale sighting. We took off in glamorous sailing gear in a small group to traverse the bay with Gentle Giants. Whilst in end we only spotted harbour porpoises (this in itself rare – the guide said that he’d only spotted them four times in the previous season), the experience was magical. Note: My sister took a whale tour in Reykjavík at the same time and she had close encounters with both Humpback Whales and Icelandic Dolphins. If you’re travelling early in the season it could be best to aim your whale time for the Southern locations. 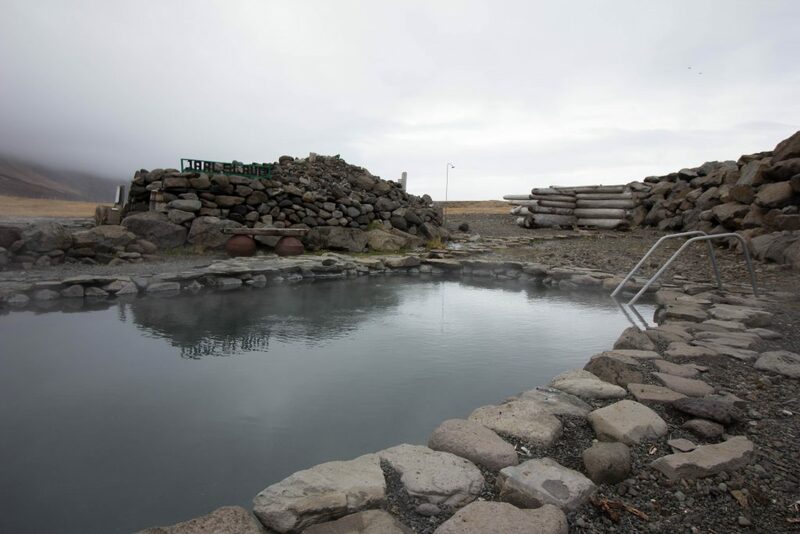 We then made our way back East to visit the Mývatn Nature Baths. 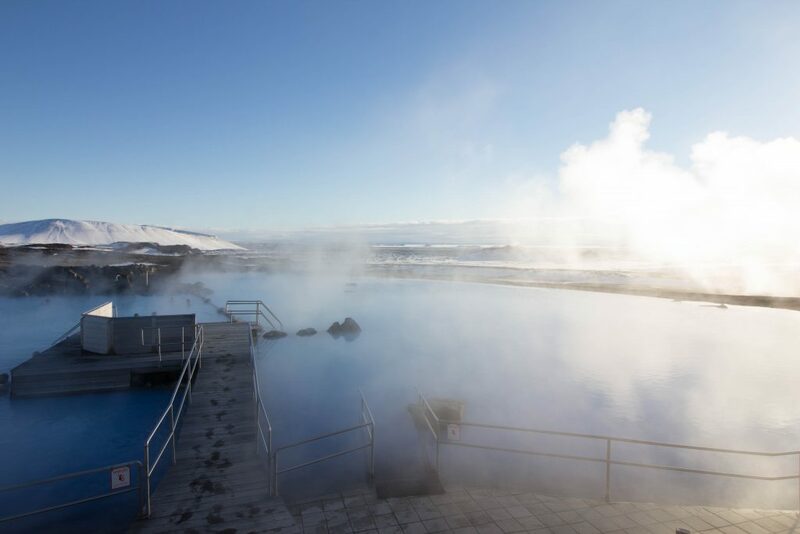 These geothermal springs are the smaller, less-touristy version of the Blue Lagoon. We had a magnificent time. 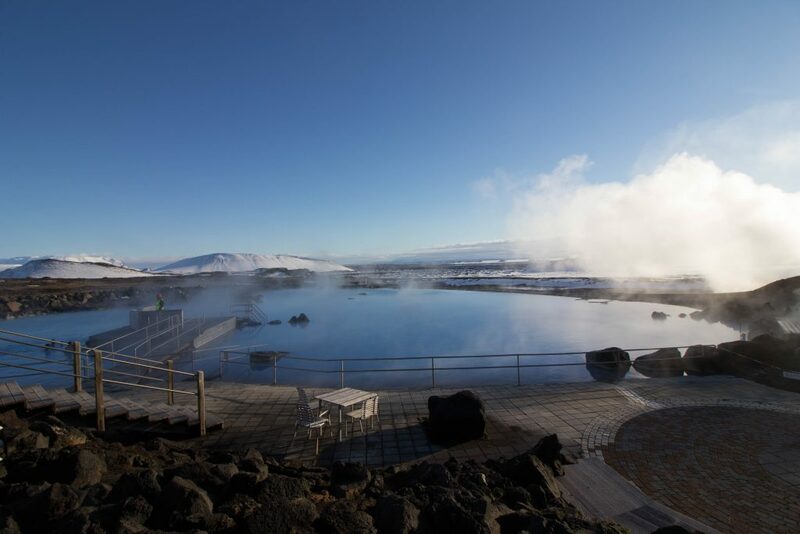 Soaking in steaming blue baths whilst gazing out over snowfields is a truly unforgettable experience. It was lovely and – like so many experiences in our little shoulder-season tour of Iceland – utterly peaceful. Next time we’ll plan to spend much more time in the Mývatn region; there seems so much to see and do there. Before holing up at Hamrar again, we couldn’t help but take Lonely Planet’s advice and sample the ice-cream at Brynja. Even huddled by the heater in our Happy Camper, it was a tasty treat. 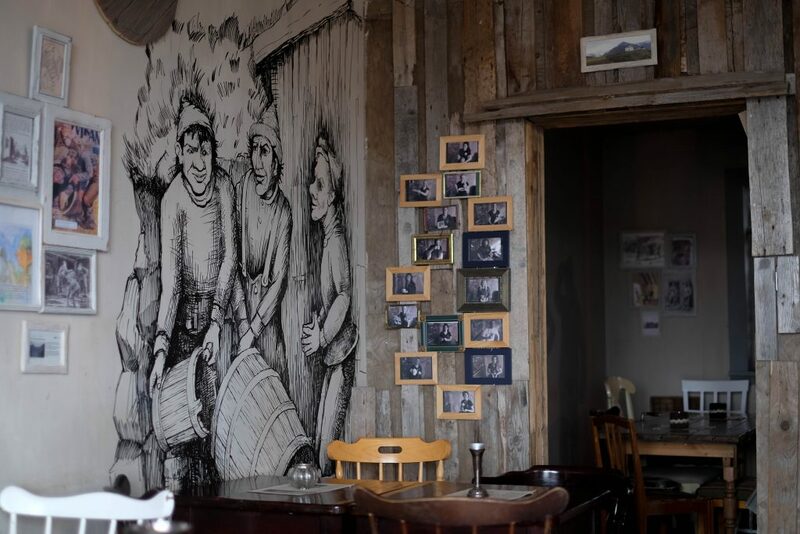 Based on another Lonely Planet recommendation, we stopped at Kaffihús Bakkabræðra in Dalvik on our way out from Akureyri – and it proved one of the best stops on our trip. 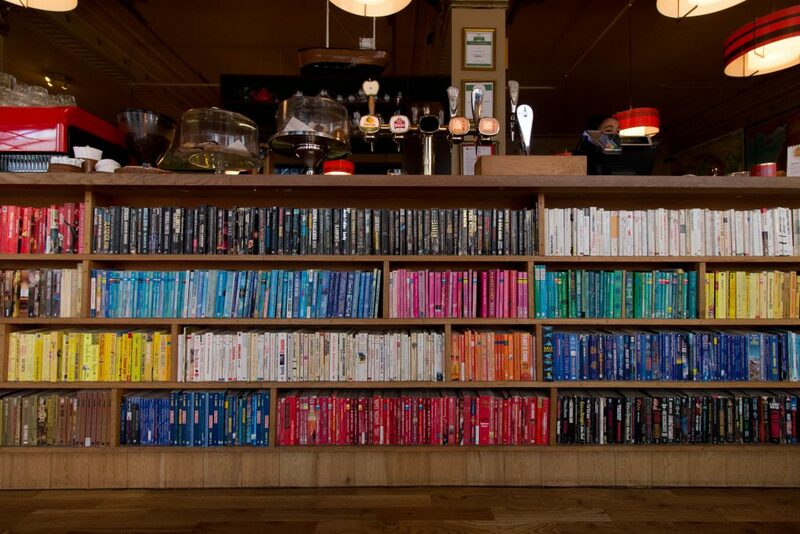 Styled on the storybooks of three dim-witted Icelandic brothers, this café/bar is wonderfully quirky and cosy. We never wanted to leave. A local couple own the establishment, and we were lucky enough to meet one half. I sadly forget his name but his hospitality was wonderful and he made us feel so at home. 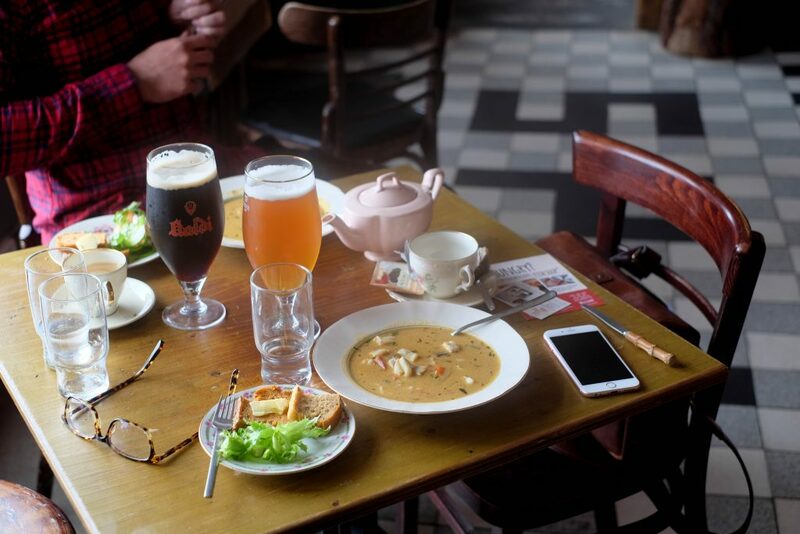 We had coffee and cake, multiple bowls of the most amazing fish soup and beer from Kaldi, a nearby brewery. By the time we were ready to leave, the café was near-packed and we so wished we could have just whiled away the day there. Next time we will! We trickled along the Tröllaskagi Peninsula, though missed much of its beauty because it was largely covered in grimy snow. Unfortunately we didn’t make it in time to swim in Hofsos’ famed swimming pool overlooking the sea, so we instead detoured out to Grettislaug on a recommendation from our friend at Kaffihús Bakkabræðra. Grettir is a renegade figure of the Icelandic sagas who swam from a nearby island to bathe in the natural hot pots there. 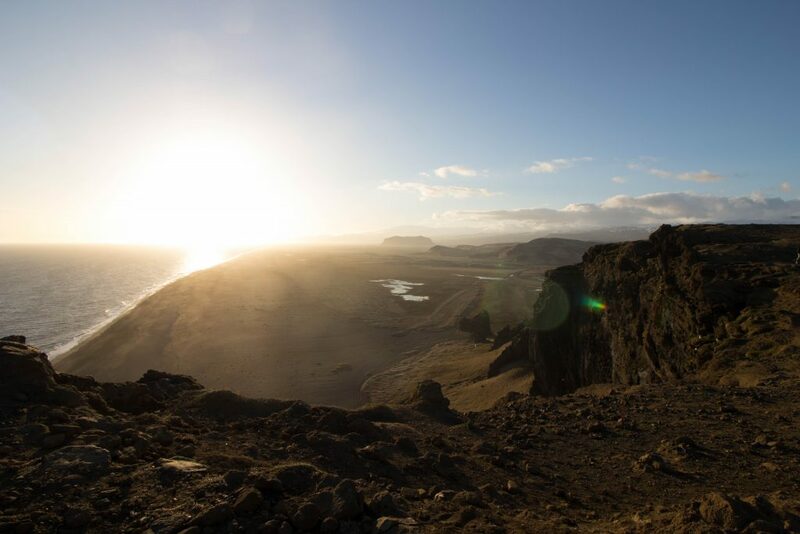 We have to agree with Grettir – whilst we only braved a very tough, unpaved road to get there, it was worth the trip. 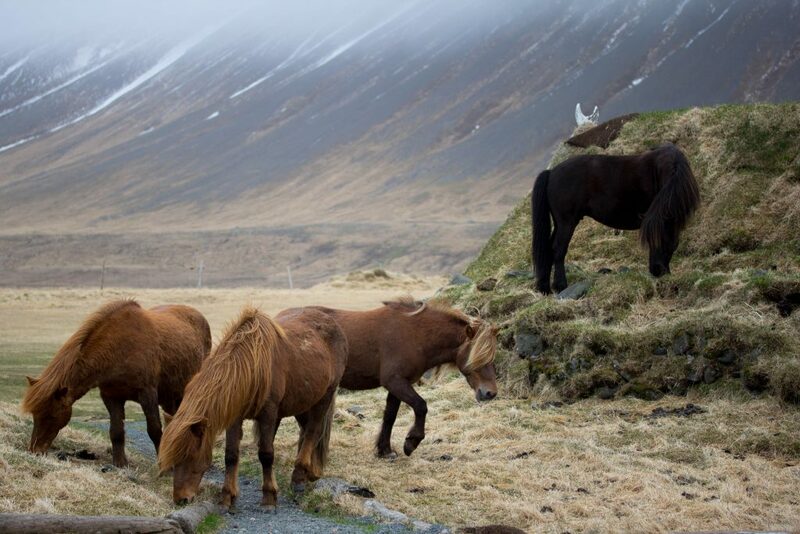 We also found a bunch of Icelandic horses grazing nearby on the turf-roofed houses. 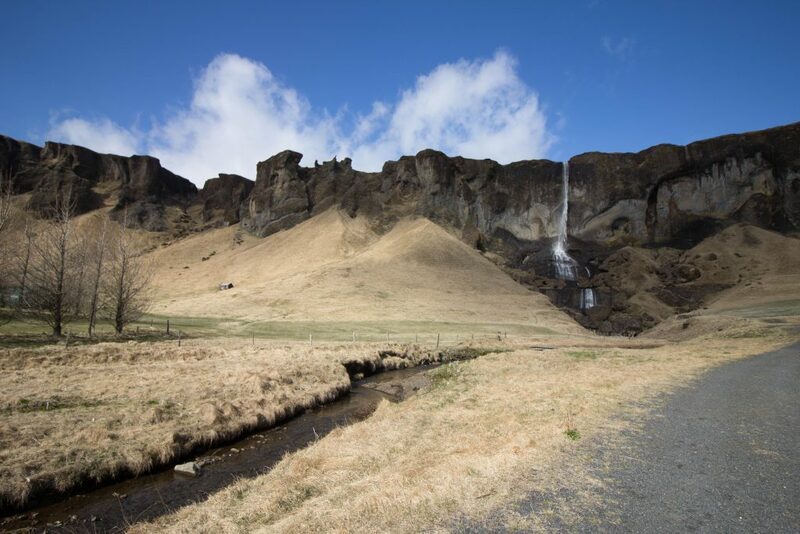 We had originally planned to camp at Blönduós for the night, but in this case we had to agree with Lonely Planet: “There isn’t much to woo you off the road, but it’s an OK place to break the journey and refuel. 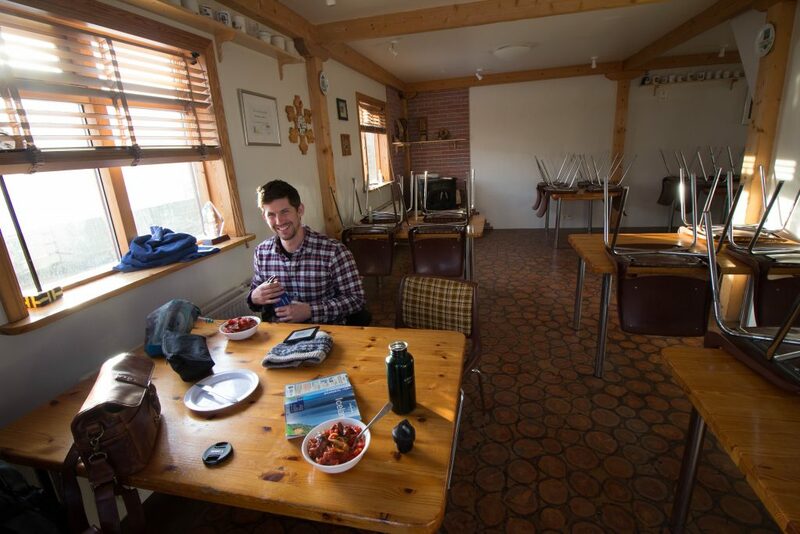 Overnight options are uninspiring.” The town’s campsite was open, but facilities were not. 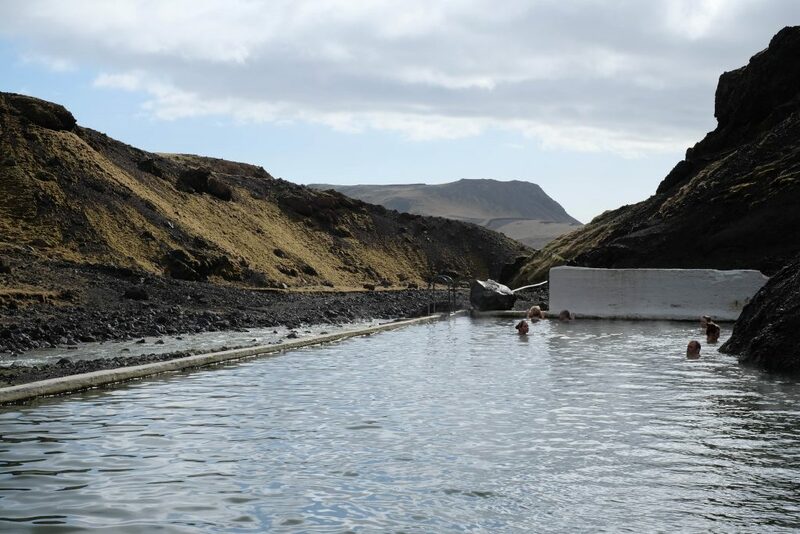 We took a chance and doubled back to Sauðárkrókur where the campsite was unmanned, but excellent shower facilities were open based on an honesty-box payment system. As a huge fan of Hannah Kent’s novel Burial Rites, we then detoured out along Vatnsnes Peninsula to Illugastaðir. For those that have read the book (and for those that haven’t – please, for the love of puffins read it now) Illugastadir is the site Natan Ketilsson’s farm. 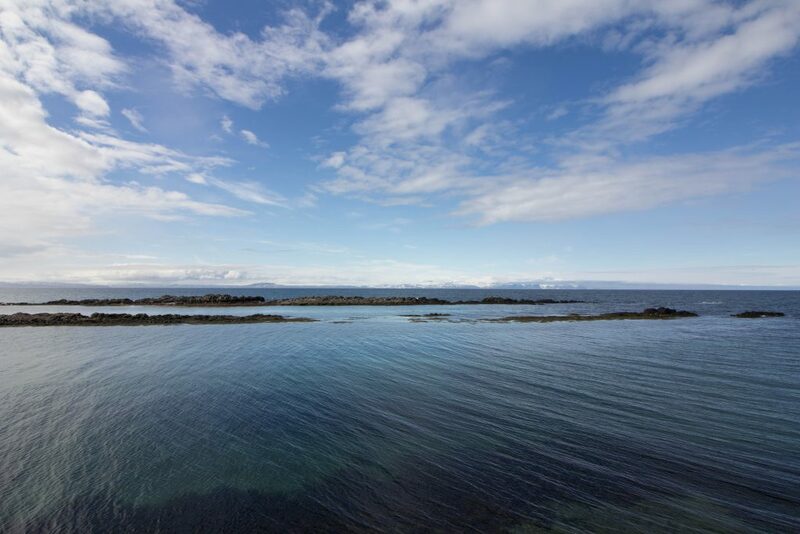 Now it’s home to a seal colony, with a lovely little walk down to a shack on the shore replete with binoculars for all your seal-spotting needs. After the stress of a day’s hard driving, the drama of a flat tyre and the consolation of Icelandic hotdogs, we decided to press on the to the end of the peninsula. 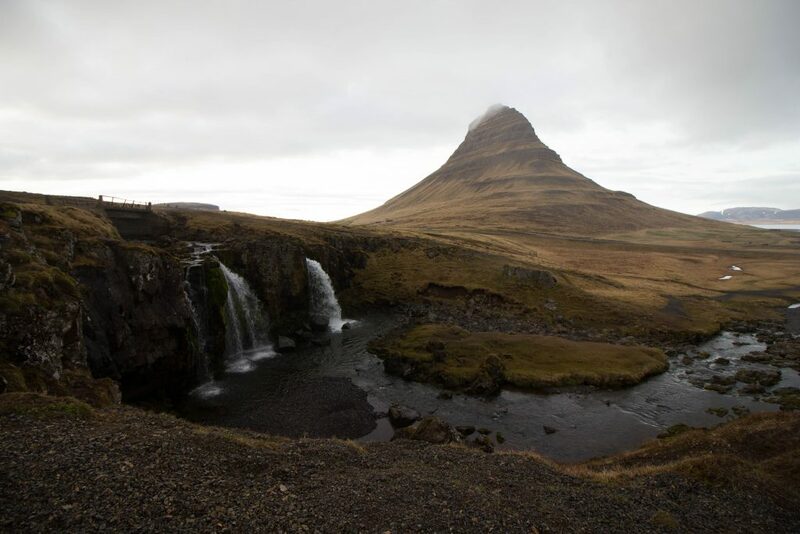 We chased the sunset almost to the Westernmost tip, passing the beautiful Kirkjufell and Kirkjufellsfoss (which feature in The Secret Life of Walter Mitty) along the way, to eventually stop for the night at the Hellisandur campsite. Well, not at it, per se. In the wee area near the gate. It, like many other campsites along the peninsula, were totally closed at this time of year. It was our last full day with the camper van. Heading into Snæfellsjökull National Park, the Westernmost tip of the Snæfellsnes Peninsula, we first drove out to the Öndverðarnes Peninsula, where a couple of cute, bright orange lighthouses reside. I wouldn’t recommend this drive without a 4×4; it was a gut-wrenching experience especially given our flat tyre the day before. Winding our back out way along the coast we visited Djúpalónsandur, the site of Iceland’s famed lifting stones. 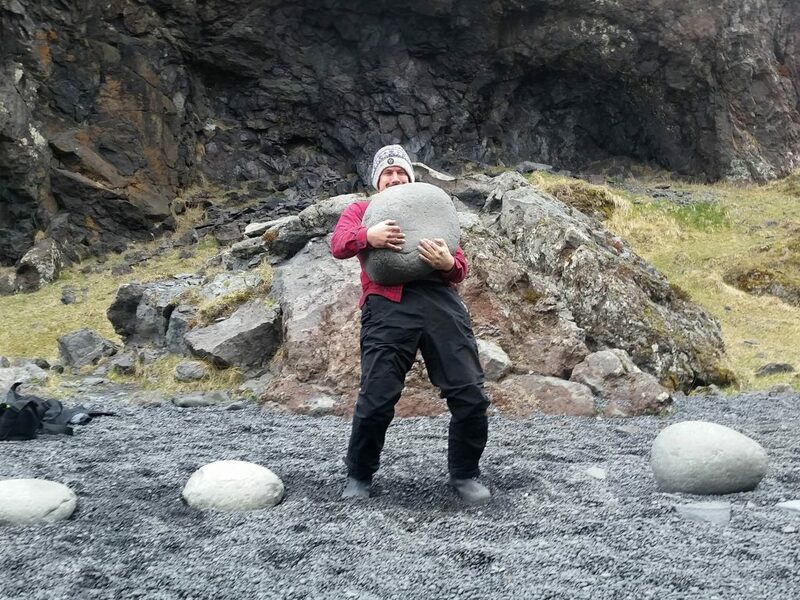 Apparently these stones determine one’s fitness or life at sea: I’m rather doomed, but Mat would make a fine sailor indeed. 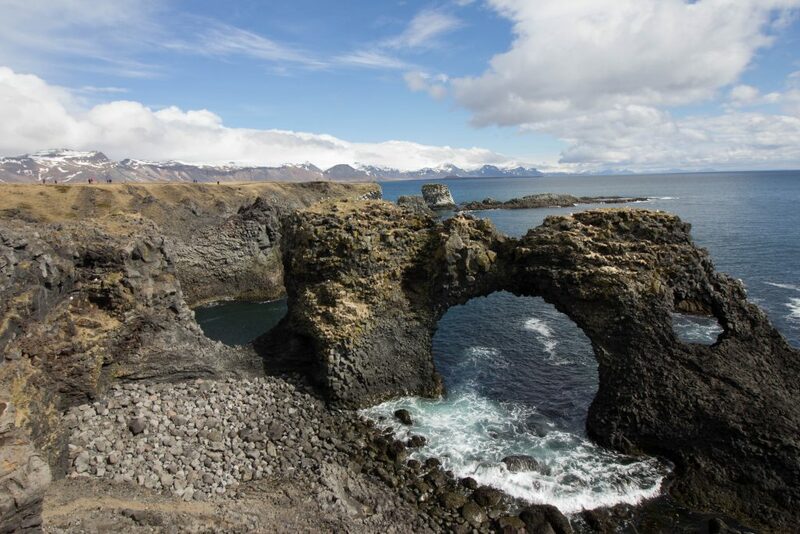 At the urge of my sister, we did a little coastal hike from Hellnar to Arnarstapi which was really lovely, as well as an organised tour down into the lava tubes at Cave Vatnshellir. This in particular was a brilliant experience exploring an emptied cavern forged by hot magma over 8000 years ago. We didn’t stop for anything along the Southern side of the peninsula, but instead decided to push ahead and cover The Golden Circle. 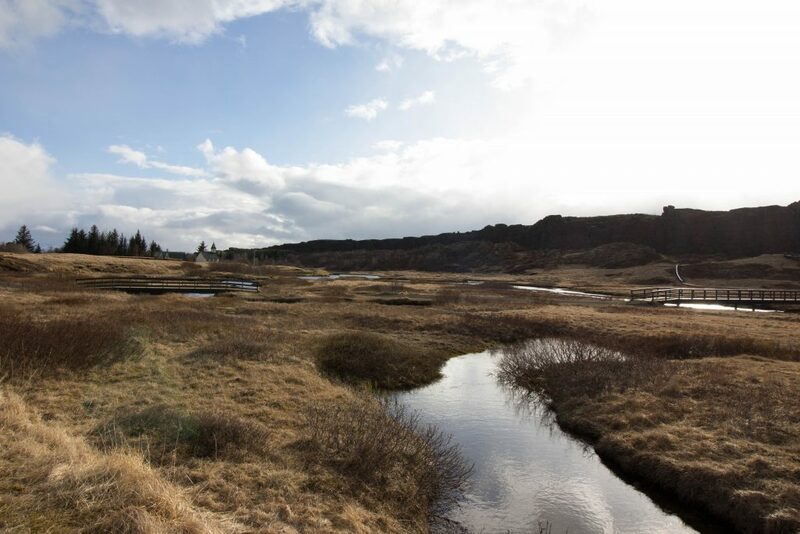 It was pretty late by the time we made it out, but Iceland’s sun persisted long enough to smash through Þingvellir National Park, the Geysir/Strokkur geothermal area and Gullfoss waterfall in a few hours. No facilities were open around any of the attractions, but it did mean there were barely any other visitors about – which is an experience at odds with what most people encounter in this area. By the time we finished up with The Golden Circle it was after 10pm, we were starving, and the fact that nothing was open in the area became a big problem. We drove for an age before finally giving in at a Dominos on the outskirts of Reykjavík. It was the best goddamn Dominos I’ve ever had. After consulting camping.is, we’d pinned our hopes on a year-round campground at Bogarnes. We were sorely disappointed, finding a completely chained-off campground. We then tried the next campsite in Akranes, which was also supposedly open year-round. Wrong. Heck, we even let the GPS guide us to another random campground, which ended up being a farmhouse in the middle of nowhere. By 1am we were back in Akranes by the sea, resigned to another showerless night on what must be the windiest little patch of grass in the world. I was honestly petrified that the gale would tip our van over! 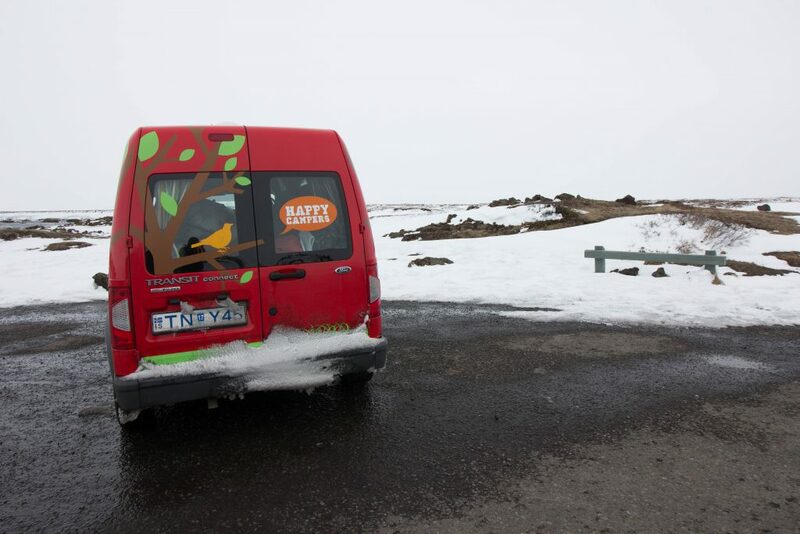 We bloody loved our Icelandic road-trip, but honestly, we were also bloody happy to hand our camper van back. It had been a wild, extraordinary time. As we said to the lovely guys at Happy Campers: we felt like totally different people when compared to the ones had that picked up that van nine days prior. The guys gave us a lift to the airport so we could catch the FlyBus into Reykjavík, which was pretty expensive, but still the cheapest way to get to the capital. It was also exceptionally slow, as we essentially had to wait for a plane to arrive to fill up the bus. But we got there in the end. We stayed in an Airbnb close to the heart of Reykjavík. As you can imagine, by this point showering and sleeping in a bed were wondrous experiences. That bed was particularly sensational. Þórunn was a lovely, welcoming host, also even cooked us waffles for breakfast the next morning. We visited Laundromat Café for dinner – a very funky café with great food and beer. 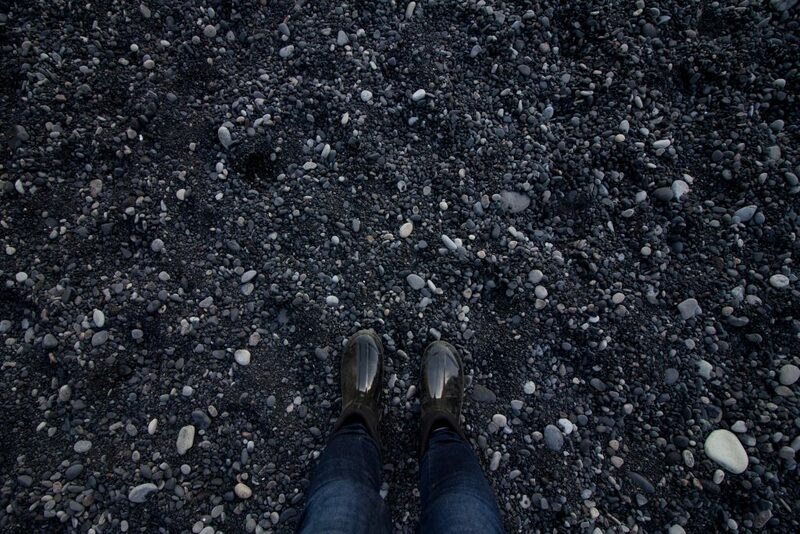 We had but one full day to spend in Reykjavík before flying out at 1am the next morning. We’d lined up an I Heart Reykjavik walking tour after discovering them on Instagram some time prior. Ásta gave our small group a lovely little tour around the city, and we used her recommendations for the rest of our day. We got a delicious, quick hotdog lunch at Bæjarins Beztu, followed by “Iceland’s best ice-cream” at Valdi’s. We visited the gorgeous Harpa centre before cosying up with a few glasses of our beloved Kaldi beer at the Kaldi Bar. Rounding out the night at Icelandic Fish and Chips, it was a last day wonderfully spent – and true to us, full of lots of delicious things. And that was our Icelandic adventure. It will not be the last. This was such a magical read. I want to go to Iceland, but now it’s on my top priorities. Oh, you must! It’s so close for you! What an amazing adventure Terri!! I can’t even pick out my favorite parts, but I think the picture of Svínafellsjökull is my favorite. The glaciers just look SO magical. And wow, what an experience to be stranded in a snowstorm… that sounds terrifying but I’m glad you were rescued! I really want to go to Iceland someday, but I would definitely want to go with someone and do the campervan experience too!